As student numbers rise, staff time is increasingly dedicated to manually grading lab reports and checking calculations. Delays in providing feedback can mean students are less likely to engage with the content of the post lab and take on board the comments and guidance offered in the feedback. Furthermore, students often complain that marking is not consistent between graders which undermines their confidence in the process. Learning technology for lab assessments has been of limited usefulness; lacking the functionality to fully handle different grading requirements and unable to incorporate the students' own data into calculations. Smart Worksheets offer a flexible, affordable post lab solution that improves the student experience whilst making your life easier. You choose the questions, the level of scaffolding and the feedback you want for your students. The questions and calculations in the student assignment relate to the data that they collect in the lab. The system can assess intermediate steps and final answers. Students get real-time feedback as they type, encouraging them to critically examine their answers before submitting. After entering an answer, the worksheet offers further feedback that is personalised to the answers they enter. For example, addressing specific misconceptions or common mistakes such as unit conversion errors. 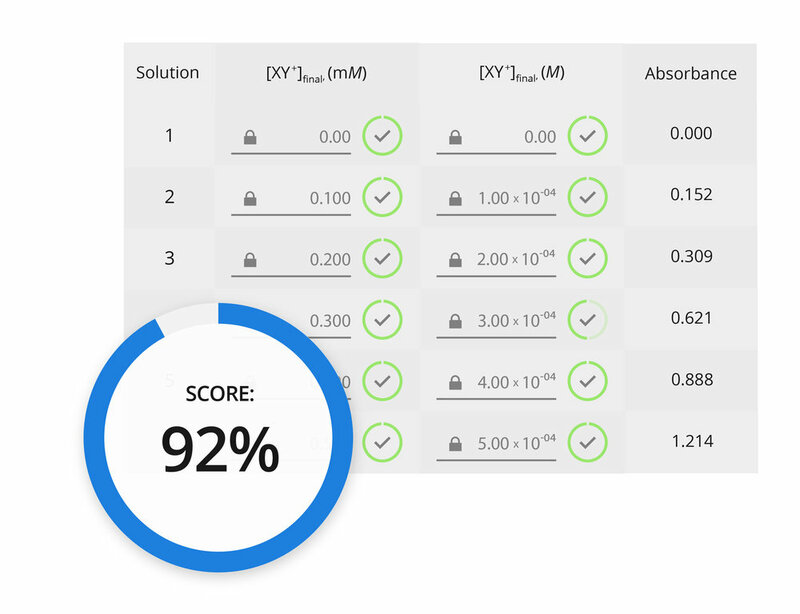 All of the questions and grading rules can be configured for each experiment to match your requirements. There is no need for a marker to go through the laborious task of checking each student's calculations and figuring out where they have made mistakes and how best to award marks and provide feedback. The system checks the validity of their original data as well as evaluating their calculated answers. You can adjust the format in which you want the student to present their answer and how you would like this to affect the grade. We work with you to create Smart Worksheets that are fully tailored to your lab needs - whether you want to add in just a few questions, or transform your post labs completely.